Population health efforts are intensely data-driven. Attaining the goals of those efforts will require that we absolutely master the art of capturing data, sharing data and using data. We’re off to a very good start with data capture. According to the U.S. Department of Health and Human Services, about 75 percent of the country’s eligible professionals and more than 91 percent of hospitals are on electronic health records certified for Stage 1 meaningful use. With the vast majority of personal health information being recorded in a sharable form, we’re poised to accelerate population health IT. Now it’s on to the next set of major challenges, which will be front-and-center at HIMSS15: sharing data and putting it to beneficial use. Charles Kennedy, MD, who serves as chief population health officer for Healthagen and the current payer representative on the Office of the National Coordinator for Health Information Technology’s Health IT Policy Committee, says recent efforts by the Centers for Medicare & Medicaid Services, and strong support from the private sector to move towards value-based payment and population health strategies, are requiring a rethinking of health IT. These challenges are significant. Sharing risk requires sharing data. Managing risk requires precise analysis. For data sharing, moving forward will require health IT innovations. These innovations must unlock the PHI captured in EHRs and exchange it in a common format with different systems of varying purposes. Moving forward will also require analytics that make that data actionable. With those solutions in hand, we’ll be able to better identify populations, coordinate care across those populations and measure our success. Another major topic at HIMSS will be both the Stage 3 meaningful use and 2015 Edition Certification proposed rules. These rules were officially introduced by CMS and the ONC respectively on March 20. The rules are vast – covering more than 700 pages – but the overall message is clear. Stage 3’s purposes will include promoting greater interoperability, greater data portability and stronger standards to ease the exchange of electronic health information. Stage 3 will also aim to further privacy, security and patient safety. This is all about the data-sharing requirement of population health initiatives, and it’s extremely important. Stakeholders in population health should look to HIMSS15 for innovations that don’t stop there. These innovations go further to deliver not just information, but actionable information. Here are a few types of solutions to keep on your radar. Be on the lookout for data aggregation teachnology that gives community information with a longitudinal view of patient data. This is the starting point of enabling breakthrough analytics based on an accurate and complete picture of a population. The goal will be to get us past the duplicate information and exclusions that come with more limited data sets. Look for solutions that use community-level data to engage the total population with the right strategies for different types of people. To best improve the health of an entire population, we must engage the entire population. Today, we focus first on those whose chronic conditions cause them to use the most health resources. For example, we’re getting better at engaging diabetics. Once we can accurately identify the population of pre-diabetics, we can target them for additional interventions – and telephonics won’t get us there. New strategies will be needed for that group, and for countless additional high-risk and “rising risk” groups. Success with them all will require innovative solutions for engagement. Also seek out technology that connect all population-health stakeholders for better collaboration. This includes collaboration among providers and also extends to patients and payers. As care payment models continue to shift toward value, and as providers and payers assume greater risk, they will need tools for collaboration and communication as they work to improve patient satisfaction and care quality while reducing unnecessary cost. We have traditionally identified high-risk patients through claims data. Being able to identify rising-risk populations will depend on our ability to analyze clinical data as well. If we don’t have the right data, we can’t identify the right patients. Be on the lookout for solutions that help to identify missing or inconsistent clinical documentation to drive clinical insight. Look also for solutions that go further to accept non-clinical data to enable more effective engagement. For example, the single mother who works full-time while raising three children may need transportation to get to an appointment, or an hour of daycare so she can exercise. In these and other instances, the creation and refinement of new ways to drive actionable insight and patient engagement strategies will be a boon to efforts to elevate population health. At this point in time, “clinical data” is mostly limited to EHRs, and the health data they capture provides an incomplete picture – snapshots of health at the time of doctor visits. While that’s a great start, the really big steps will come with patient-centered solutions for gathering clinical data, and they’re sure to be a major focus at HIMSS. Look especially for wearables that can track a person’s sleep, calorie consumption, blood glucose and oxygen levels, and more. The value of these solutions goes well beyond managing patients with chronic conditions. Collecting continuous data on populations as a whole, from the chronically ill to the healthiest, can contribute to the coming of big data in population health and fuel health management across the board in ways we can only begin to imagine. 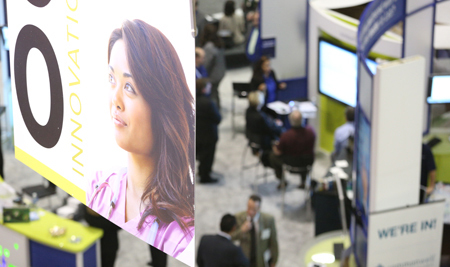 While there are many advanced technologies to focus on at HIMSS, professionals involved in any aspect of population health will especially want to seek out the kinds of innovations covered here. And while you’re there, please come by the Medicity booth (#3431) so we can talk about the future of interoperability and Stage 3 meaningful use. I will have attempted to completely digest the proposed rules by then, and will be happy to answer questions – and I welcome any and all who would like to try to stump me.